Hello all! Sorry I have been absent. I was taking a blog holiday. I am semi back to work, so hopefully I will be able to post 2-3 times a week. I am currently reading It by Stephen King. Let me start by saying I love King and I am sure I will wind up loving this book too- I am bout 25% done. BUT- it is SO creepy. I thought The Shining was super scary, but the whole “it” and the town of Derry has me so unsettled. 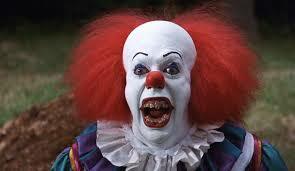 It doesn’t help that I am pathologically afraid of clowns. I love Stephen King – yet have never read this one. I need to though – hope you enjoy it! !